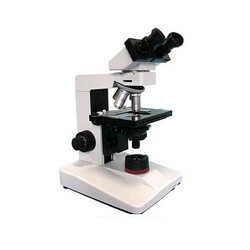 Prominent & Leading Manufacturer from Mumbai, we offer t 500 tissue culture inverted microscope, t1000 tissue culture microscope, t 100 tissue culture microscope, t 200 tissue culture microscope and szm 6745 stereo zoom microscope. 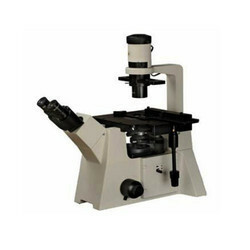 500 inverted biological microscope is the potent guarantee of your success. Excellent universal infinity independent plan achromatic optical system provides you with a high quality imaging. T 500 inverted biological microscope provides a flexible upgrade path to meet your applications for observations of phase contrast, fluorescence, polarization, digital and photographing easily, and also can work with heat stage, patch clip, assistant stage harmonious. The adapter can connect various kinds of camera and digital observe device. 72mm ultra-long working distance condenser provides enough space for culture dish. Ergonomic machine design can make you work easily for a long time. Interpupillary distance 52~75mm,45 Degree inclined,diopter adjustable. Seidentopf trinocular head which is at the side of the main frame can be worked with digital camera and computer. It doesn't influence the binocular observation. WF10X/22, High eye-point up to21mm. WF10X/20(Pointer), High eye-point up to21mm. WF10X/22(Pointer), High eye-point up to21mm. Reticule eyepiece CROSSWF10X/20, High eye-point up to21mm. Reticule eyepiece CROSSWF10X/22, High eye-point up to21mm. Mechanical stage 350x208mm, moving range 50x50mm, low-positioned coaxial flexible adjusting handle. 72mm Extreme long work distance condenser, NA0.3, with iris diaphragm, 6V 30W halogen lamp house, filter jack. Phase-contrast slide makes it easy to change between 10X, 20X, 40X phase contrast and bright field observation. Excellent Optical Function with Infinitive Optical System. Ergonomically designed, constructed with high quality component through the whole microscopes. T 100 mostly used for observation and research on living cell, tissue, fluid and deposit , especially unstained limpidity living materials. T 200 Inverted Microscopy System provides versatility and high quality images for bright field and phase contrast observation. 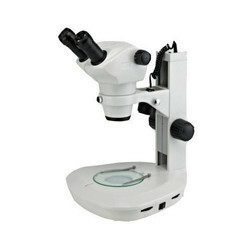 Ergonomically designed and Constructed with high quality component through the whole microscopes, T 200 Inverted Microscope is the ideal instrument for micro tissue culture and other advanced applications, widely used in the field of Biology, Microbiology and Immunology Observation. Both finity and infinity optical system for Option. 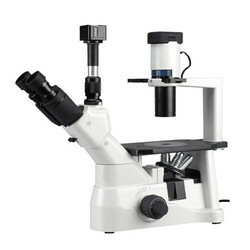 With the large zoom rang and long-working distance.These are ideal for high-magnification, high-resolution observation in biological research, precision-oriented semi-conductor and other industries. The SZM6745 with 0.67X~4.5X zoom magnification, inclination angles of 45 Degree respectively, the working distance can be up to 105mm when the lens is 1X. 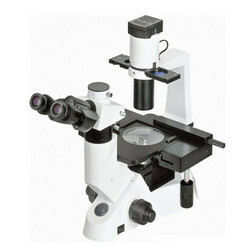 Looking for Tissue Culture Microscope ?